Luxus Skatkarten was first published by the bookseller and publisher Theodor Oswald Weigel (1812-1881) in around 1880. The cards shown here are from a facsimile edition published by F. X. Schmid, Munich, in 1981. The artist is believed to have been Emil Doepler "the Younger" (1855–1922), a German Art Nouveau illustrator, decorative artist and art teacher. 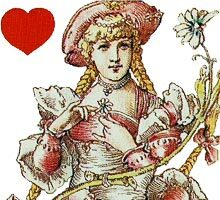 The artwork follows the tradition of German playing card design and conveys a vivid sense of emotion, sensuality and vitality. 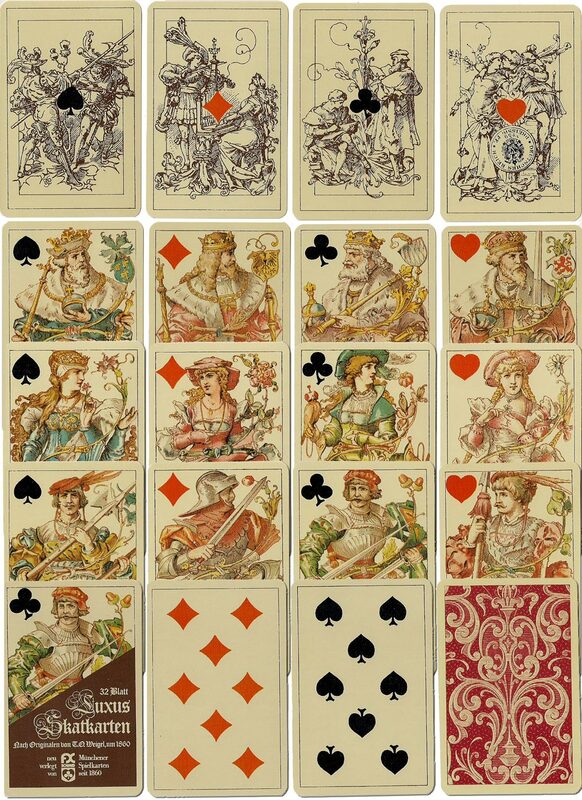 The four Aces depict full-length drawings and the court cards are double-ended fantasy renaissance figures. Above: reprint of T.O.Weigel's "Luxus Skatkarten" (c.1880), reprinted in facsimile by F.X.Schmid, Munich, 1981. 32 cards, no indices. It is odd that Schmid did not get the date right. They possibly confused father and son, both being artists and both having similar styles. The back design is not the original. The original backs are described as having a crown, an eagle and heraldic devices on a blue and beige field. An earlier facsimile was printed by von Wezel & Naumann, Leipzig-Reudnitz, in c.1935. Schmid produced a later facsimile, identical to this one except that indices were overlaid.